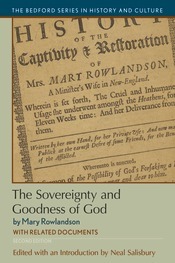 Mary Rowlandson’s The Sovereignty and Goodness of God, first published in 1682, is an English Puritan woman’s account of her captivity among Native Americans during King Philip’s, or Metacom’s, War (1675-76) in southeastern New England. In this new edition, 21 related documents support Rowlandson's text, which is reprinted from the earliest surviving edition of the narrative. Neal Salisbury’s revised introduction reflects the changes in scholars’ understandings of issues relating to Rowlandson’s captivity and her narrative that have occurred in the twenty years since the publication of the first edition. Five new related documents include a little-known narrative of Muslim captivity by a Puritan contemporary of Rowlandson’s, a treaty that exhibits the motives of both English and Native American signers, an account of the forced removal of Christian Indians to Deer Island during Metacom’s War, and two visual documents. The volume’s document headnotes, footnotes, and appendices have been thoroughly revised in light of recent research and interpretations.